If you are looking for a band with a fresh and exciting sound, then look no further than Finland’s Von Hertzen Brothers or VHB. Based out of the country’s capital of Helsinki, Von Hertzen Brothers consist of Mikko Von Hertzen (vocals, guitar), Kie Von Hertzen (guitar, vocals), Jonne Von Hertzen (bass, vocals), Juha Kuoppala (keyboards), and Mikko Kaakkuriniemi (drums). More than your average rock group, they showed plenty of progressive and psychedelic influences on their previous album, Nine Lives, and they have turned up their game for their latest release, New Day Rising. New Day Rising goes above and beyond what you would expect from a typical rock album. They are not afraid to mix things up and veer off the established trail, which plays to their advantage. The turns and surprises along the way are fantastic and enriching. If there is a band that you take chance on, then let it be Von Hertzen Brothers, and if there is an album to take a chance on, then let be New Day Rising. “New Day Rising” is a tone setter, for sure, with its alluring opening rift. The drums and the keyboards roll in at just the right point to spice things up. The vocals are clean, smooth, and passionate. The energy from this song could light up a city and makes for a smashing opener. It is the type of song that you will have you hitting the replay button. “You Don’t Know My Name” grabs you with its crazy, manic opening that never really lets up, and, gets faster in some places. The multiple vocals sound fantastic. There are a couple twists and turns during this song that make it quite interesting and hard to forget. It is not your average sounding rock song and that is a very good thing. “Trouble” starts out nice and light before the heaviness drops in with a magnificent crash. Overall, the song has a cool melodic tone to it and the vocals carry much emotional weight for my favorite performance on the album. The music falls and rises are just the right spots for maximum effect. Taking the sound of the album in a different direction, “Black Rain” pleases with its light and breezy sound. The sound is toned down and less heavy, but the quality of the music is still the same. “Hold Me Up” is more of a soft rock song than anything else. The music is melodic, catchy, hopeful, and might just bring a smile to your face. “Dreams” is great rock song with some pop influences that makes for easy listening. It is catchy, harmonious, and snappy, making for a great sing-along song. This is a good song if you need a little pep in your step and makes for a great springtime tune. “Sunday Child” begins with two minutes of slow build-up to a brilliant climax. It continues to charm with its soothing chorus and positive energy that exudes from the music. This is the type of song that can brighten up any rainy day. “The Destitute” opens up fast and funky before slowly morphing into a more heart wrenching and emotional sound. “Hibernating Heart” is a mellow conclusion that is pleasant sounding, yet bittersweet. 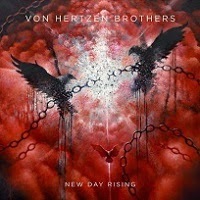 Von Hertzen Brothers’ New Day Rising is an absolute gem of an album. It definitely surpasses their pervious album, Nine Lives, a solid production in its own right, in every way possible. New Day Rising is not just for rock fans, but also for people who love high quality music. This album is a finely crafted piece of work that is a prime example of the beauty that can be found in music.